It's absolutely normal to sleep at different temperatures (in fact, we nearly all do! ), and this will affect which comforter is most suitable for you (and your partner, if you sleep with one). Our recommendation will be based on having your room at a comfortable sleeping room temperature which we advise should be maintained at 16-18 degrees centigrade. We wanted to create something different. A range of products that not only look beautiful, but feel amazing. That give you peace of mind, as well as a peaceful night’s sleep. We’re proud of every single part of our range; no matter the price, or level of comfort you choose, we apply the same rigorous standards of quality to every piece. Each part of our sleep system works together to help regulate your body temperature, to keep you cool on hot summer nights, and cosy in the darkness of winter. Because we use the finest natural materials, you know there are no artificial barriers, or flame-retardant chemicals to inhale. Our range is designed to let your body breathe in symphony with your own circadian rhythm. The Secret to Better Sleep? Try a Wool Comforter. From night sweats to sneezes, there are plenty of factors that can disrupt your sleep. Still, it’s also true that you can often improve your sleep quality simply by making your bed a better place to be. 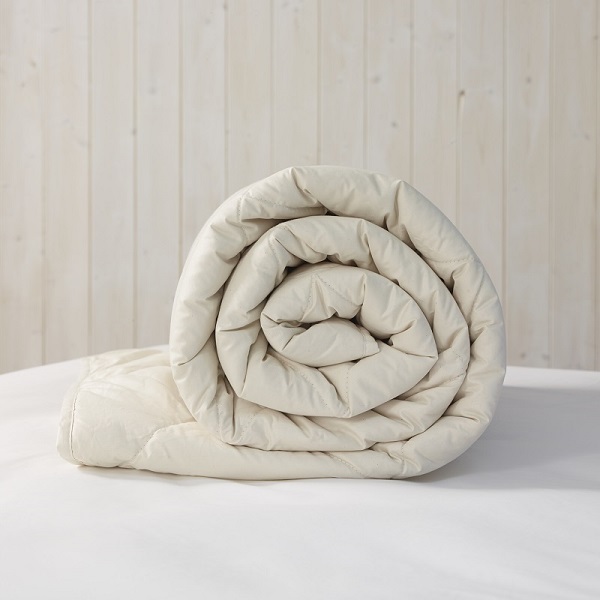 A luxury comforter made from breathable, natural wool is a great place to start. Why? It has been scientifically proven that sleeping with wool delivers 25% more stage 4 and 5 regenerative sleep. That's the stage when your body does most of its 'repair work', which helps you feel refreshed and rested when you wake up. These are the benefits that synthetic, feather and down just cannot offer! An introduction to a natural, healthy night’s sleep. Constructed using 100% carded British wool filling enveloped in a 200tc cotton outer. Contains no synthetic materials or harmful fibres. Naturally flame retardant without the need for any unpleasant chemicals. Naturally hypoallergenic and the only natural bedding solution that holds the Allergy UK Seal of Approval. Our Classic bedding is entirely natural, so shouldn't need cleaning often. When you do come around to cleaning it, it would need to be taken to a dry cleaner. The only truly 100% machine washable British wool bedding range on the market in the UK. Our Deluxe range uses wool from Downs Breeds that are hand selected and have full farm provenance. Constructed using premium 100% British fibres and a 200tc organic cotton outer for the ultimate natural sleep. Our softest, most luxurious organic range to date. Filled using a 50/50 blend of organic British wool with the finest alpaca fibres, quilted between a 300tc organic unbleached cotton outer to deliver our best natural sleep experience. Naturally flame retardant without any unpleasant chemicals. Our Luxury bedding is entirely natural, so shouldn’t need cleaning often. When you do come around to cleaning it, it would need to be taken to a dry cleaner. Our recommended room temperature is between 16-18 degrees which is what we base our comforter weights on. This is something to consider when you are making your decision on which weight to choose. Which Range is Best Suited for Me? "Love the Woolroom, my wool comforter is super warm....I have allergies and this has been the answer for me. Would love a pillow saving up for that! Thank you Woolroom.....my comforter is amazing and I so look forward to cuddling up to my wool comforter." "I am now appreciating my wonderful wool and Alpacca comforter. I have arthritis which always seems to be worse in cold and damp weather. I am "toasty" all night, perfect! So glad that I chose the warmest one. I would thoroughly recommend this product." "Great service parcel arrived a day early. Comforter is beautifully finished and is light but very warm and no overheating or stickiness if you have memory foam matress. Well worth the money." "I’m in love! with my new wool comforter. It’s light but warm but not too warm. I’ve always used feather before but this light wool comforter has completely changed my thinking. It’s all natural fibre and it’s British. What’s not to love! Service excellent, packaging very good and reusable. Well done Woolroom you have a fan." "We're very happy with the comfort and feel of the Woolroom set we purchased. It has exceeded our expectations and has not triggered any of our allergies thus far; which was the main reason for our purchase. The lushness of the feel is superb and we greatly appreciate the ability to control temperature throughout the year with the "2-in-1 comforter" solution. Packaging and handy carrier / storage bags are also a major plus. Thank you and keep up the good work!" "Ordered a classic warm comforter for winter. Love that it is still so light and yet feels so warm. Great cocoon effect." "I have been waking with sweaty sheets, partly due to cancer medication, and possibly also the memory foam topper. The wool mattress protector went over the topper and wow! best night’s sleep for ages. I’m now going to save up for the wool comforter and pillow. I can’t recommend it highly enough." "Great comforter. Previously had a 4.5 tog duck feather comforter & it was too warm. The new comforter breathes really well & keeps you cool at night. Sleep has been much improved." "Quick, fast, efficient and personal service. Thank you. Great comforter. It feels right with all changes of weather. I will be buying my next comforter from Woolroom." "I ordered the all season comforter. It arrived within two days of placing the order (and as I live in the back of beyond that was a very pleasant surprise). I am also extremely pleased with the comforter, which is light but still keeps me warm without being too hot. AND - added bonus - #smugface - my daughter (29) didn't know about wool comforters." "Excellent products, info, price & delivery. What's not to like? Absolutely delighted with my wool comforter. Great weight, very warm - lovely." "Great product. Best nights sleep with a wool comforter"
"Thanks woolroom, a convert if there ever was one, we have wool comforter,wool topper,and our fabulously confortable pillows." "A wonderfully comfortable summer comforter, just right for the extremely hot nights Delivery was very prompt. I have slept much better since I started using the comforter and would definitely recommend it." "I bought a sheeps wool and alpaca comforter..the dispatch and delivery was efficient and the packaging and quality of the product is exellant. We are delighted with the comforter and the ethics of the company and have already recommended to others." "The Woolroom is a company I like to deal with. Their customer service, website, ordering process and delivery is great. Their products are also very good quality. I have been sleeping in my summer weight wool comforter, wool pillows and on my wool mattress topper for almost 12 months. I’m not hot even in this weather. I’m not cold in the terrible winter we had. They keep you perfect temperatures and my husband says the same." 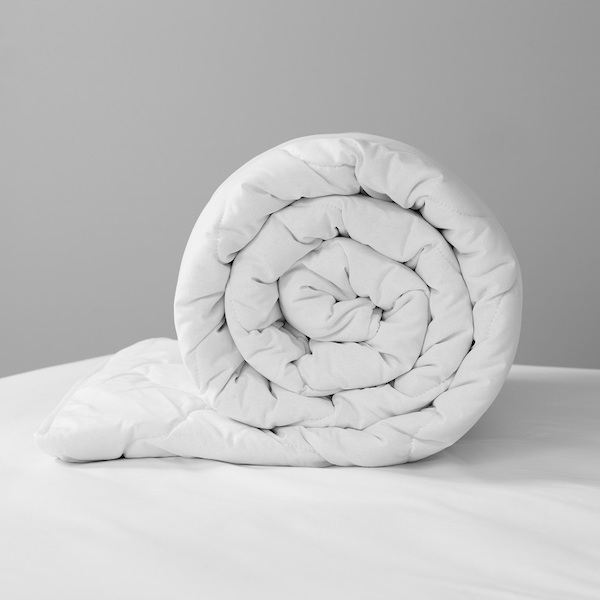 "This was our third purchase of a wool comforter from Woolroom. We were so impressed with the benefits that we have been rolling them out (quite literally) for all the children." "Is true to it's advertising details. I have slept under a wool comforter for several years, the same one winter and summer!" "The comforter I ordered from the woolroom is fantastic!! The Classic Wool Comforter - Light kingsize keeps me cool at night time its 5*s - would definitely recommend!!" "For a start, Woolroom staff are unanimously delightful, pleasant and helpful. I've phoned a few times as I have trouble with untreated wool and was dubious about buying wool products. I was quite wrong... I have now had my bed set of pillows, comforter (luxury light) and mattress cover for long enough to know that they are fabulous to sleep with!" "Prompt service. I bought a pillow and comforter which are great and although the temperatures at the moment are very high I have slept really well without getting hot." "Choosing our new comforters from The Woolroom has been very, very straightforward. Delivery has proven to be swift and the quality of the products absolutely splendid." "You can tell that I am happy with the comforters as I have just made my second purchase. 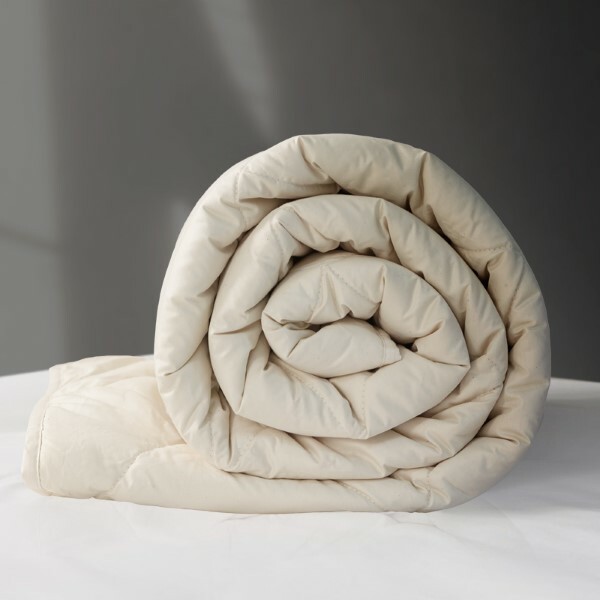 The same lightweight comforter is suitable for summer and winter. It appears to adapt to the ambient temperature. I have recommended The Wool Room to a friend." "I bought this for my 5 year old son who gets really hot when he sleeps. I’ve only used it for a week but so far he’s been happy and not woken with night sweats. Product looks well made and there was no nasty smell which some bedding products seem to have when new."